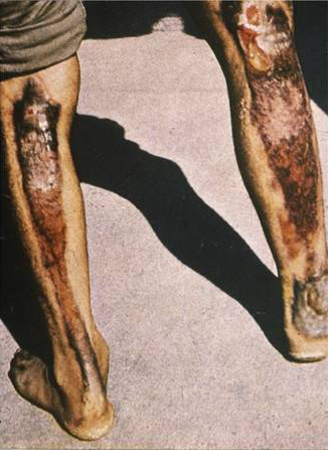 Third-degree localized burns of skin exposed at about one mile from ground zero. Photograph from Modern Medicine, December 1, 1956. The photograph to the left shows typical flesh burn on exposed skin only. this man was in the open approximately one mile from ground zero in Hiroshima. The photograph was taken seventy-nine days later shows partially healed second-degree burns with keloid formation.